Description: Amazing geometric abstract wall art! 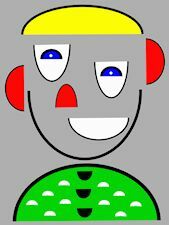 The artwork displays a stylized geometric face of a clown made with semi-ellipses. The style parallels the style of Kandinsky and others but is based on math. Specifications: 12 in by 16 in by 3/4 in (30.48 cm by 40.64 cm by 1.90 cm) giclee print on a stretched canvas (unframed). Background: GEOMETRY, from the Greek geo (land) and the Greek metria (measurement), is the branch of mathematics that focuses on objects on a plane. Euclides, the Greek philosopher and mathematician, in a book titled The Elements of Geometry, set forth, in great detail, the foundations of modern geometry. ELLIPSES are flattened circles where the sum of the distances from two points, called the foci, to every point on the ellipse is constant. CLOWNS have been favored by artists by and children of all ages. Shipping / Delivery: This artwork is ONLY shipped to the Continental United States directly from the printer. Expect delivery in 10-15 days. Description: In the artwork, chaos dictates the dizzying display of geometric lines and shapes. 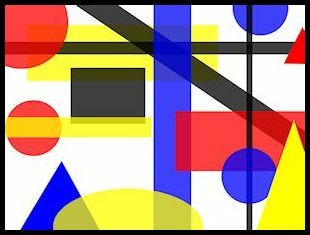 The style parallels the style of Mondrian, Kandinsky, and others but is based on math. Math: GEOMETRY, from the Greek geo (land) and the Greek metria (measurement), is the branch of mathematics that focuses on objects on a plane. Euclides, the Greek philosopher and mathematician, in a book titled The Elements of Geometry, set forth, in great detail, the foundations of modern geometry. CHAOS, from the Greek khaos (empty), nowadays, is defined as lack of organization. Description: The artwork features an approximation of the golden spiral created using golden rectangles. 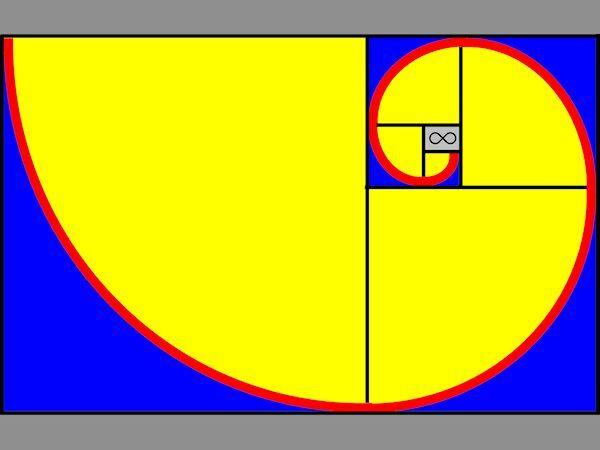 Math: In geometry, a golden spiral is a logarithmic spiral whose growth factor is φ (i.e., 1.6180), the golden ratio. That is, a golden spiral gets wider (or further from its origin) by a factor of φ for every quarter turn it makes. Description: The painting features an stylized graph of an upward parabola displayed on the Cartesian plane. The style of the painting parallels the style of the Dutch artist Pieter Mondrian, but the design is based on mathematics. Specifications: 12 in by 16 in by 3/4 in (30.48 cm by 40.64 cm by 1.90 cm) acrylic painting on a stretched canvas (unframed). Math: Parabolas are graphs of quadratic equations. 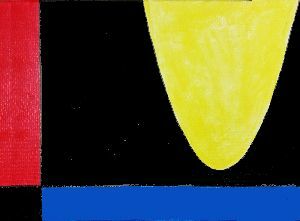 The painting displays the graph of y = 1/2 (x-9.5)2 + 1, where 5.25 ≤ x ≤ 13.75. Thus, the parabola is wide, moved 9.5 units to the right, and moved 1 unit up. The parabola is shown on the 1st quadrant of the Cartesian plane. Shipping / Delivery: This artwork is ONLY shipped to the Continental United States. Expect delivery in about 10 days. 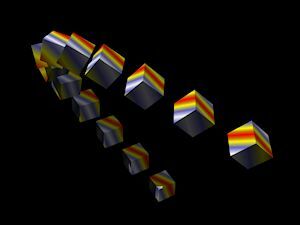 Description: The artwork features an array of colored cubes floating in Aristotle's aether. Math: A pseudo-hologram is a 2-D rendering of a 3-D object, which is created digitally using an application like XenoDream (an industrial-strength, 3-D graphics application) and which is created, unlike true holograms, without lasers. The term is taken from the Greek words pseudo (false), holos (whole) and gramma (message). Holography was developed by Dennis Gabor in 1947.